Can I phone or e-mail an order for pick-up? Of course! The best way to place an order is through our online ordering system. However, you can also contact us at any of our locations and one of our Managers would be happy to assist you with placing an order over the phone or via email. Please note that, due to the high volume of orders that we fulfill during peak periods, we may occasionally be unable to accommodate your preferred order date and time. Do you accept call-ahead orders for same day pick-up? Because we receive a large volume of pick-up orders for each day, we request that all call-ahead orders be placed by 5:00pm the day before. When circumstances allow, we do our best to accommodate same day pre-order requests, but in any event, you may always come into the shop during our regular business hours and purchase any number of cupcakes as a walk-in customer. Please note that Georgetown Cupcake may impose earlier order cutoff dates and times for order dates when we are fulfilling a high volume of pickup, delivery, and national shipping orders. If I placed a pre-order, do I have to wait in line? Not at all! If you placed a pre-order, you can walk into the store and one of our Store Associates would be happy to assist you and retrieve your order. Do I need to pre-pay? For all pick-up and delivery orders, we kindly requestpayment in advance. Our delivery drivers do not accept cash on delivery. Can I order a flavor that is not available on the day of the week I will be picking up my cupcakes? Unfortunately, we are only able to offer the selection of flavors available on our menu on the day of your order. However, we do make exceptions for large catering or corporate orders of 10 dozen or more per flavor. Please contact one of our locations and a Manager would be happy to assist you with your order. Does Georgetown Cupcake deliver locally and ship nationwide? Yes! Georgetown Cupcake delivers to the Metro DC, New York City, Boston, Los Angeles, and Atlanta areas and ships to the lower 48 States via UPS. The minimum order for delivery or nationwide shipping is one dozen cupcakes. What is the earliest time I can have my cupcakes delivered? Georgetown Cupcake delivers via local courier in the Washington DC metro area, New York City, Boston, Los Angeles, and Atlanta seven days a week and customers may choose from the available delivery time windows on our website when placing an order. Our earliest three-hour delivery window is 10am to 1pm. Our latest delivery window is 4pm to 7pm. Please note that, during peak delivery periods, Georgetown Cupcake may occasionally be unable to accommodate your specific requested delivery window. Can I have my cupcakes shipped to me? Yes! We offer nationwide shipping to the lower 48 states via overnight UPS. Please visit our order page to place a national shipping order. For any national shipping-related inquiries, please email shipping@georgetowncupcake.com. Does Georgetown Cupcake only bake cupcakes? Yes! Our menu includes over 100 flavors of cupcakes and we regularly add new flavors. For daily flavor offerings, please refer to the menu on our website. In addition to cupcakes, we serve a variety of specialty coffees, teas, espressos, and lattes. Does Georgetown Cupcake sell mini-cupcakes? Yes, we do offer mini cupcakes! Mini cupcakes are available by pre-order in quantities of 2 dozen mini cupcakes per flavor. The cost is $35.00 for 2 dozen mini cupcakes and you can choose from any of the flavors available on the menu on the day of your order. We recommend that you store your cupcakes at room temperature. If you will be consuming the cupcakes more than 24 hours after purchasing them, we recommend freezing them and they are good for up to 10 days after they are purchased. To thaw them, leave them at room temperature for 2–3 hours before they are to be served. Does Georgetown Cupcake offer cupcake decorating classes? Yes! Georgetown Cupcake hosts holiday-themed cupcake decorating events at various times throughout the year. Be sure to sign up for Georgetown Cupcake's email newsletter to be alerted of upcoming events at each location. Does Georgetown Cupcake offer discounts for large volume orders? For orders of 50 Dozen or greater, we are happy to extend a 10% discount off our dozen price. For orders of 100 Dozen or greater, we are happy to extend a 20% discount off our dozen price. We are also pleased to offer custom fondant decorations at no additional charge. For large volume orders, please contact one of our locations and a Manager would be delighted to assist you. For corporate orders involving multiple locations or multiple recipients located in different cities, please contact corporateorders@georgetowncupcake.com. Does Georgetown Cupcake have a mobile app? Yes! Download our new FREE Georgetown Cupcake App from the App Store or Google Play and start earning rewards with your online and in-store Georgetown Cupcake purchases! What is the earliest that I can have my cupcakes shipped to me? Georgetown Cupcake offers nationwide shipping to the lower 48 states via UPS. In general, UPS delivers all packages by 4pm, though we unfortunately cannot guarantee a specific UPS delivery time. For any national shipping-related inquiries, please email shipping@georgetowncupcake.com. Do I need to order my cupcakes in advance? Not at all! We are happy to serve walk-in customers. For our store locations and hours, please click here. Does Georgetown Cupcake offer custom fondant decorations? We decorate our cupcakes with a variety of handmade fondant hearts, flowers, and other seasonal decorations. Georgetown Cupcake is also pleased to offer custom fondant decorations for special occasions including holidays, birthdays, weddings, bridal showers, baby showers, and corporate events. In addition, cupcakes can be customized with personal monograms, corporate logos, or photos replicated on fondant. Custom decorations are offered at no additional charge. To inquire about placing a customized cupcake order, please contact and a Manager would be delighted to assist you. For corporate orders involving multiple locations or multiple recipients located in different cities, please contact corporateorders@georgetowncupcake.com. What color fondant do you have? We offer a wide variety of fondant colors! For special events, we can match the fondant decorations to the color of your choice or alternatively, our fondant artists can choose a color that will look best with your order. To discuss a custom order, please contact one of our locations and a Manager would be delighted to assist you. For corporate orders involving multiple locations or multiple recipients located in different cities, please contact corporateorders@georgetowncupcake.com. Does Georgetown Cupcake offer special frosting colors? Yes, we do offer special frosting colors for orders placed in advance. Color options include baby blue, baby pink, bubblegum pink or sunshine yellow frosting on either chocolate or vanilla cupcakes. To discuss a custom order, please contact one of our locations and a Manager would be delighted to assist you. For corporate orders involving multiple locations or multiple recipients located in different cities, please contact corporateorders@georgetowncupcake.com. Can you put my company logo on a cupcake? Yes! For large custom orders, please email us a JPEG image and we can replicate it on the fondant decorations for your cupcakes. To discuss a custom order, please contact one of our locations and a Manager would be delighted to assist you. For corporate orders involving multiple locations or multiple recipients located in different cities, please contact corporateorders@georgetowncupcake.com. Does Georgetown Cupcake cater for weddings, baby showers and other events? Georgetown Cupcake creates beautiful and memorable cupcakes for special events in life. For ideas and inspiration, please check out the photo gallery and information our catering page! For more information or to inquire about placing a special event order, contact one of our locations and a Manager would be delighted to assist you with your custom order! Does Georgetown Cupcake offer favor boxes? We do offer single cupcake favor boxes for $0.50 per favor box. We also offer favor boxes that hold 4 mini cupcakes for $0.50 per favor box. The favor boxes are our standard pink boxes sealed with a Georgetown Cupcake sticker. We are also pleased to offer gift-wrapping services at $1.50 per box. Does Georgetown Cupcake offer on-site set up? Unfortunately, we do not offer on-site set-up or display services. However, our Managers would be delighted to offer different presentation suggestions. In addition, please be sure to check out the photo gallery on our catering page for ideas and inspiration! Does Georgetown Cupcake rent cupcake stands? Unfortunately, we do not rent our silver cupcake display stands. However, we do sell 3-tier cardboard cupcake stands that are available with a choice of black, white, or pink Georgetown Cupcake ribbon trim for $10 each. Each 3-tiered stand holds up to 2 dozen cupcakes. You may order these cupcake stands on our order page when placing your order. Can I reserve Georgetown Cupcake for a private event? Our Washington DC, New York City, Boston, Los Angeles, and Atlanta stores are available to reserve for private events on an as-available basis. To inquire about booking a private (social or corporate) event at Georgetown Cupcake, please email info@georgetowncupcake.com with information on the desired date of your event as well as the number of guests. Can I serve alcohol at my private event at Georgetown Cupcake? Georgetown Cupcake does not sell or serve alcohol at any of its locations in Washington DC, Bethesda, New York, Boston, Los Angeles, or Atlanta. Customers who wish to serve alcohol at their private event at Georgetown Cupcake must comply with local regulations and obtain a special alcohol license or hire a caterer who possess a license to serve the alcohol. Does Georgetown Cupcake have Red Velvet cupcakes? Yes! We have Red Velvet cupcakes on our menu every day! Georgetown Cupcake’s signature vanilla cream cheese frosting is less sweet than Georgetown Cupcake’s vanilla buttercream frosting. We are pleased to offer both frosting options on our daily menu. Does Georgetown Cupcake offer any "alcoholic" cupcake flavors? No. Georgetown Cupcake does not bake with any liquor or alcohol. Does Georgetown Cupcake offer any gluten-free, vegan or sugar-free cupcakes? Georgetown Cupcake is pleased to offer both gluten-free and vegan cupcake flavors and we are constantly adding new flavors to our menu. However, Georgetown Cupcake is not an allergen-free bakery. Since we bake with high volumes of wheat (gluten) flour and dairy products on our premises, we advise customers with gluten or dairy allergies to err on the side of caution and refrain from eating our cupcakes. If I have a nut-allergy, should I eat at Georgetown Cupcake? Georgetown Cupcake is NOT a nut-free bakery. Many of our flavors contain peanuts or other nut products. We recommend that customers with nut allergies err on the side of caution and refrain from eating our cupcakes. Are charitable donations available from Georgetown Cupcake? Georgetown Cupcake is proud to partner with many national and local charitable organizations and foundations, in particular charities that focus on women's and children's health issues. Since opening in 2008, Georgetown Cupcake has donated tens of thousands of cupcakes to charitable causes. For all inquiries related to charitable donations, please e-mail us at donations@georgetowncupcake.com. Are there employment opportunities available at Georgetown Cupcake? For more information on employment opportunities at Georgetown Cupcake, please click here. How can I follow Georgetown Cupcake on social media? 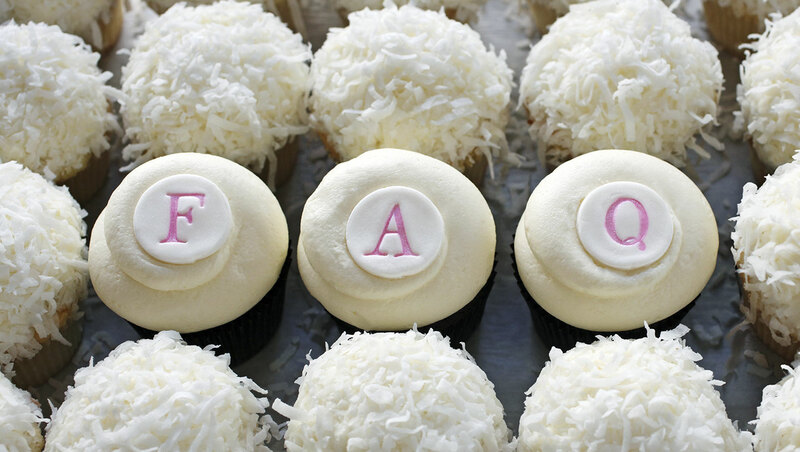 Georgetown Cupcake regularly posts exciting news and upcoming events to its Facebook page and sponsors trivia contests where fans can win free cupcakes!